Image caption The hunting group said the cat's death was a "complete accident"
A cat has been "mauled to death" by a hunting hound in its owner's back garden. In a Facebook post, Helen Keyzor, from Norbury in Staffordshire, said her cat Rosie had been killed on Tuesday. Ms Keyzor said she was "heartbroken and angry" at the death of her 15-year-old cat who "didn't stand a chance". The Albrighton and Woodland Hunt said one of its dogs fatally injured the pet and it was investigating the attack "thoroughly". The group said hunt members tried to save the animal, which it called "elderly". 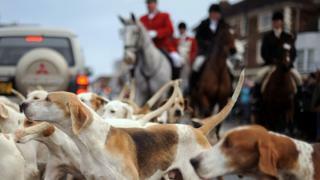 Is fox hunting barbaric or a British tradition? Ms Keyzor said the family has had Rosie "since she was a kitten". "We didn't expect her to die in such a horrible way." Naturalist and broadcaster Chris Packham shared the post on Twitter, describing hunting as "anarchic pet killing and disregard for life, people and property". Staffordshire Police confirmed it was investigating.